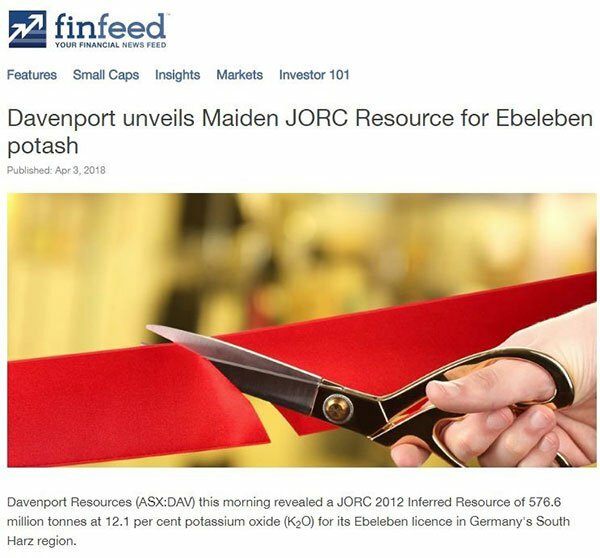 Davenport Resources (ASX:DAV), with a new Managing Director at the helm, this week confirmed a JORC Resource at its Ebeleben Potash mining licences in the South Harz region of Germany. DAV’s decision to explore and develop these historical potash licences is strategically sound as potash plays an increasingly important role in meeting the challenge of feeding the world’s growing population. As a critical ingredient in plant fertiliser potash improves a crop’s production yields by improving a plant’s retention of water, nutrient value, taste, colour, and resistance to diseases and pests. The licences acquired by DAV were extensively explored in Germany’s pre-unification era and substantial historical Resources had previously been calculated under the old German Democratic Republic (GDR) system. DAV has now converted one of these areas to JORC 2012 compliant Resources, having engaged leading mineral industry consultancy, Micon International, to undertake an in-depth review of exploration data from two of the three potash Mining Licences acquired by DAV in October 2017. Micon reviewed 31 historical drill holes on the Ebeleben licence and the results that have come from this review are impressive. 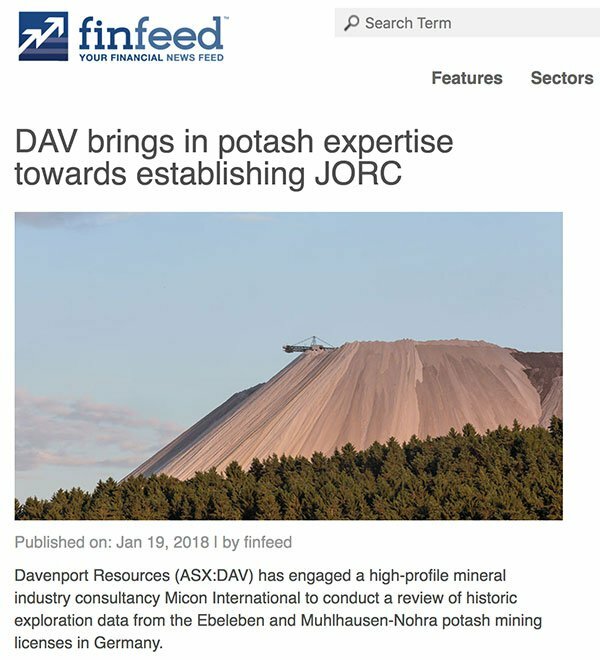 DAV has now announced a JORC 2012 Inferred Resource of 576.6 million tonnes at 12.1% potassium oxide (K20) for its 100% owned Ebeleben licence. This is the first step in DAV’s JORC pursuit as it seeks to obtain Europe’s largest declared potash resource. Reassuringly, UK-based Micon has a track record of converting Soviet-era Resources into JORC 2012-compliant Resources, so their job here has just begun. The conversion to JORC 2012 augers well for DAV’s future as it continues its South Harz potash journey. 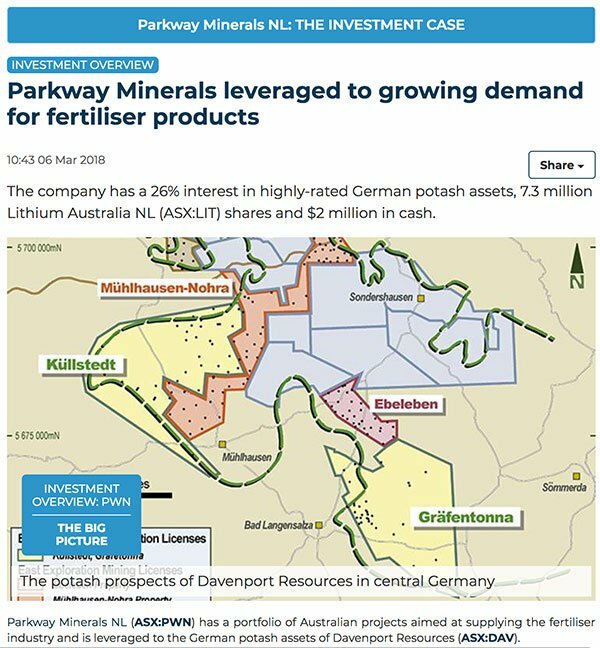 Davenport Resources (ASX:DAV) holds three perpetual mining licences and two potash exploration licences in Germany’s Thuringen state. The licences cover a combined total area of more than 650 square kilometres across the South Harz potash basin. Historic drilling and mining in the basin demonstrate that the licences are underlain by a continuous potash horizon. The region has a history of producing potash from both Sylvinite and Carnallitite ores and produced approximately 3.3 million tonnes of potassium oxide (K2O) annually prior to the re-unification of Germany, the former German Democratic Republic. Historically, potash ores have been mined by both conventional underground and solution mining operations. The company recently reviewed historical Resources for its acquired licences and has just announced the successful conversion of its Ebeleben licence to current JORC 2012 standard. DAV last year purchased Ebeleben, Muhlhausen-Nohra, and Ohmgebirge mining licences in the South Harz region. These added to the company’s assets in the region — its existing Küllstedt and Gräfentonna exploration licences. All three of the new licences, which adjoin DAV’s existing exploration licences in the South Harz region, are unique and valuable, being perpetual mining licences granted under the former GDR system. Notably, they are not subject to expiry, rent, royalties, or reporting requirements of the current German tenure system. Here is the location of DAV’s South Harz exploration and mining licences, including the three new licences. As you can see, the Ebeleben mining licence area adjoins mining license areas, Mühlhausen and Ohmgebirge. DAV also has exploration licences and historical drill data for the Küllstedt and Gräfentonna areas. The licences have each been extensively drilled. In total, more than 100 deep drill holes were sunk leading to the creation of an extensive exploration database that would cost in excess of €100 million to replicate based on current industry costs. Analysis of the data found that for both the Ebeleben and Muhlhausen-Nohra licences, historic Resources had been estimated. This historic sylvinite Resource at Ebeleben is 356 million tonnes at 16.1% potassium oxide (K2O) (57.4Mt of contained K2O). According to DAV’s estimates, this equates to an equivalent 91 million tonnes of potassium chloride (KCI) calculated using the former German Democratic Republic (GDR) system. At Muhlhausen-Nohra, the Muhlhausen sub-area DAV has declared that it contains a historic resource of 234 million tonnes at 14.4% potassium oxide (5.8Mt of contained K2O) in hartsalz, which is further supplemented by an additional 54.4 million tonnes at 10.6% potassium oxide (5.8Mt of contained K2O), contained in carnallitite, an alternative type of mineralisation to hatsalz. The hartsalz resource is classified as C2 according to the former GDR system, while the carnallitite resource carries a lower classification of c2. “The quality of data collected from Ebeleben and Miihlhausen-Nohra over several drilling campaigns dating back to the 1970s gives us confidence that we will soon be able to declare JORC-compliant inferred resources for both projects. In an endorsement of DAV and its ambitions in Germany’s South Harz region, late last year, Parkway Minerals took a substantial holding in the company, buying 19 million DAV shares. The company already had a portfolio of Australian projects aimed at supplying the fertiliser industry prior adding a holding in DAV to its portfolio. As announced on January 18, DAV engaged leading mineral industry consultancy, Micon International to undertake an in-depth review of exploration data from the Ebeleben and Muhlhausen-Nohra potash Mining Licences. The goal of the review and subsequent geological modelling was to have the historic Resources converted to current JORC 2012 standard, as this standard governs the reporting of mineral Resources to the ASX. A review of the historical exploration data began right after DAV received formal approval by the Thuringen State Mining Authority to transfer title of the recently purchased Ebeleben, Muhlhausen-Nohra, and Ohmgebirge mining licences to East Exploration Gmbh. New MD Dr Chris Gilchrist oversaw the review by Micon, which has experience reviewing historical resources estimated under the former GDR system, using the original data to model the Resource and, where possible, compiling a Resource estimate that’s compliant with the JORC 2012 code. DAV believes this is just the first of many JORC conversions to come in the region and recently appointed managing director Chris Gilchrist who will work further with Micon to bring the remaining licences to a similar level. Of course, there is a great deal of work to do here, so investors should maintain a cautious approach to any investment decision made with regard to this stock. On March 1, Dr Chris Gilchrist started in the role of Managing Director after being appointed as a Non-Executive Director in February 2017. European-based Gilchrist is a highly experienced international mining executive with more than 35 years of mine management and director level experience under his belt. He has successfully built and managed large mining operations in Europe as well as in Africa and has significant experience in potash mining, processing and marketing. This comprehensive experience makes Gilchrist uniquely placed to progress DAV’s potash ambitions in Germany’s South Harz region. Whilst most of the focus has been on DAV’s German potash play, it has also been working hard on Australian soil where it recently announced a Maiden Resource for its NT gold-copper project. 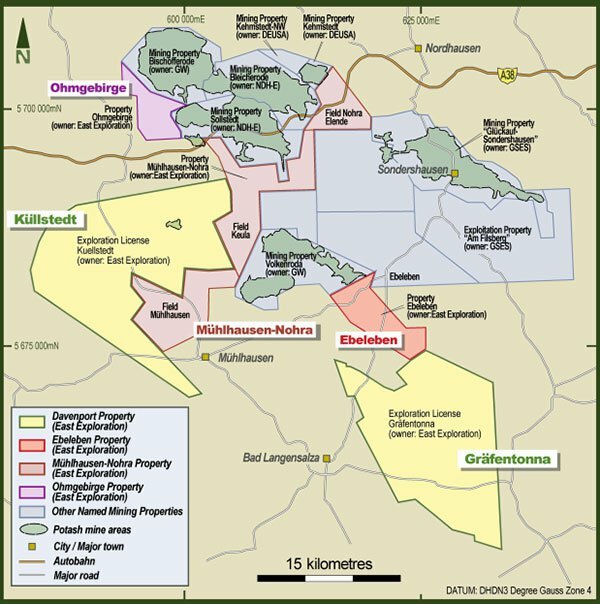 On March 28, DAV announced a maiden Mineral Resource estimate for the Johnnies Reward gold-copper deposit. 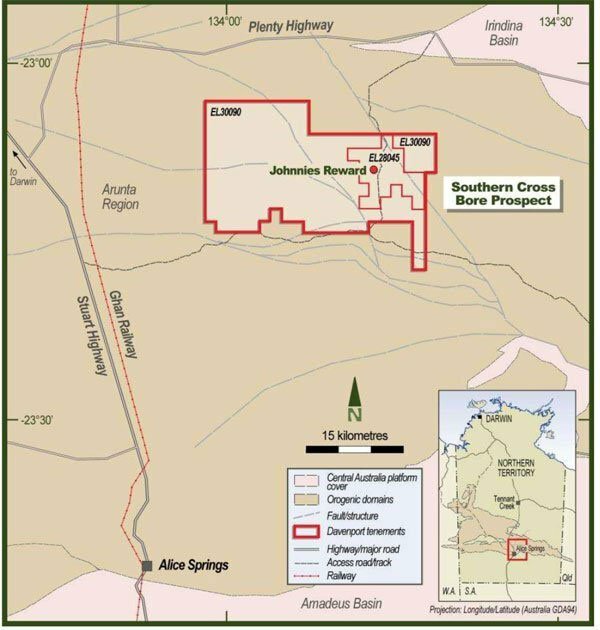 Johnnies Reward is part of DAV’s 100%-owned Southern Cross Bore Project in the Northern Territory. The Inferred Mineral Resource estimate stands at 2.2 Mt @ 1.4 g/t gold equivalent for 101,000 ounces gold equivalent for the project. Prepared by Conarco Consulting, the Resource includes 52,000 ounces gold at 0.7 g/t and 9,000 tonnes copper at 0.4% and incorporates assays from 41 drill holes including nine diamond, 15 percussion and 17 RC holes for a total of 4699 metres. It extends from an ‘outcropping gossan through a transitional weathered zone’ that is approximately 20 metres thick, with fresh rock beneath. From exploration undertaken so far, it is open down-dip as well as along strike to the north. Follow up targets are now being considered including another outcropping gossan with anomalous rock-chip samples (Two Amigos) and historic copper workings (Pinnacles). Being open in nature and down dip for several hundred metres along strike suggests that there is scope to significantly extend this maiden resource. No doubt DAV will continue to work on Johnnie’s Reward in the background as it looks to ramp up its potash ambitions. The above article suggest that demand in both India and Europe is to increase, with India set to import around 4.5 million tonnes of MOP (Muriate of Potash commonly known as potassium chloride). Further to that, producers and buyers expect availability to tighten placing upward pressure on prices. This should no doubt work in DAV’s favour, but also positive for DAV is the closure of K&S’s Sigmundshall potash site. 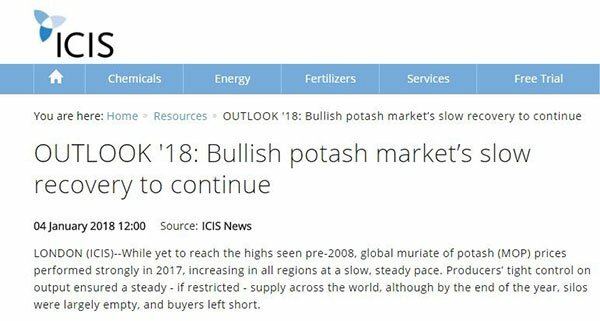 K&S will cease work by the end of the year and if DAV can grab hold of Europe’s largest declared potash resource, it would be in a very strong supply position in the heart of Europe. Now that DAV and Micon have converted historical Resources on its exploration assets in the South Harz region to a JORC 2012-compliant Resource at Ebeleben, it has its sights set on doing the same for its other licences. It is early stages here though and TKM has a lot of work to do so investors should seek professional financial advice if considering this stock for their portfolio. Ebeleben is just a small a small area, which now has a significant resource that compares favourably with historic data and the recently announced exploration target. The company is working at pace to bring its other licences to JORC standard. If it is successful in doing this, DAV will be in possession of Europe’s largest declared potash resource at a time when potash is coming into high demand. And with a market cap of around $3 million, this microcap could well see renewed investor enthusiasm if it continues on its current conversion path.